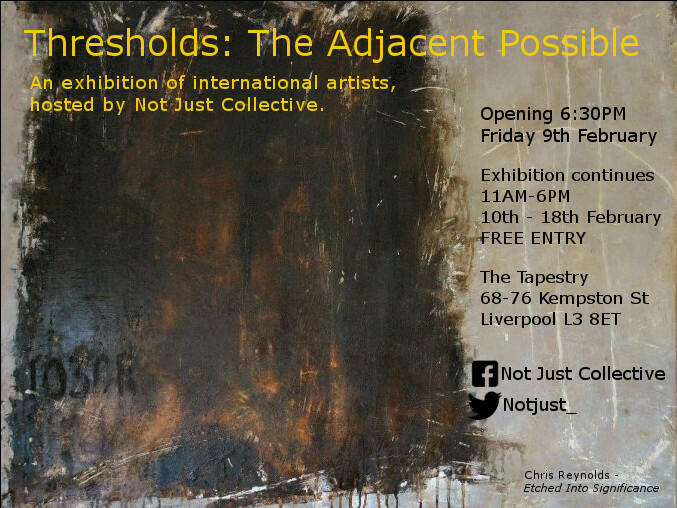 An exhibition of international artists, hosted by Not Just Collective. Opening night: 6:30-9:00PM, Friday 9th February 2018. Venue: The Tapestry, 68-76 Kempston Street, Liverpool L3 8ET. Exhibition continues 11AM-6PM, Saturday 10th – Sunday 18th February. Featuring multi-disciplinary work from over 40 artists, local, national and international, Not Just Collective present their new exhibition on the subject of borders, barriers, transition and liminality. The Tapestry, currently undergoing an exciting redevelopment, serves as a fitting venue for the show. We take inspiration from urban regeneration, abandoned spaces, and the role of Liverpool as a port city. Also considered are thresholds that are less-than- tangible – social, political and spiritual – and the well-established or newly-born practices and rituals that may develop during times of change. As artists we work to create the object that solidifies the time, the idea and the emotional response. The opening night will feature performances including music and storytelling. Please RSVP via Eventbrite to confirm your attendance. Not Just Collective are a group of artists and creative practitioners based in, or connected to, the Liverpool area. The collective was initially formed by Liverpool Biennial volunteers who, having dedicated our time to the international festival, believed we should also support local creatives – including each other – in finding ways to showcase our work. The collective’s first exhibition was in January 2013 at Domino Gallery, Liverpool, and since then we have continued to grow, holding exhibitions in galleries and non-traditional spaces across the region, including Camp and Furnace, Arena Gallery, the Williamson Tunnels, and a terraced house in L8. The group is diverse, made up of artists with varying levels of experience, and working in a range of disciplines. Because of this, we are held together not by common practice, but by a common aim to support and promote the development of art in Liverpool and the wider region.